Value betting in matched betting and the offers available today. Value betting is always the best way to make money in any kind of betting and the same applies to the world of matched betting. If you aim to make money from betting in general, you should always be looking for value and there are many different ways to place value bets in matched betting. This article aims to cover some of the value bets and value strategies so that you can further maximise your profits from matched betting. With value bets, you won’t be guaranteed a profit every time you place a bet but you will be taking value every time guaranteed. In the long term, the value will put you in a position of profit which will be significant enough to wipe out any other qualifying losses. Ultimately you have to trust the numbers and have faith in what you are doing. The early payout offers are my favourite type of value bet to place in matched betting and I have won several hundred pounds a time by doing these offers and they are exciting. Essentially you back a football team to win the game in 90 minutes and if that team goes two goals up, the bookmaker will pay you out early. The huge profits from this offer come from the opposing team managing to equalize or take the lead. This is because you will have been paid out early from the bookmaker and you will also win your lay bet at the betting exchange meaning you have made a bumper payout by winning at both the bookie and the betting exchange. In a game between Sevilla and Barcelona recently, I managed to make a profit of £223.00 exactly. In the very worst case scenario I would have lost about £2.12 which I am more than happy with. Here’s why. Given I made a profit of £223.00 and my qualifying loss could be £2.12, I would have to lose 105 bets in a row, one after the other to just break even from this offer. If I lose 106 bets in a row, I would then be at a loss overall from this offer. Now what are the chances of me attempting this offer and losing 106 bets in a row all one after the other? They are very slim! I would have to be extremely unlucky for this to happen to me. This is why this is good value because I have a good chance of making a profit from this offer over the long term. Even if I lose 30 bets before my next payout, I would only lose £63.60 but then I would make another £223.00 profit again! There are many other value bets out there like the small list below but I don’t do these offers regularly enough so it would be dishonest for me to talk about them like I actually do them but they are good value offers over the long term. But for me these offers are nowhere near as good as the early payout offer in matched betting. Nor have I had anywhere near the excitement from these offers as I have with the early payout offers. The reasons I don’t do these other kinds of value offers is because I really like the early payout offers. Not only does it provide good value, but it also gives me a thrill. When I have placed a bet on a football game and it is also on the television, it provides a fantastic experience. When the team you have backed goes 1-0 up, you watch in hope that the team will go ahead and grab another goal because if they do, you will be paid out early at the bookmaker. I have done this offer loads of times and I have lost more games than I have won but that doesn’t bother me because I already knew that before I placed the bets. However the amount of profit I will make from one winner will far exceed all the other qualifying losses. This is much better value than going into a bookmakers with £2.12 and throwing it away on a 15-fold accumulator which provides little to no value at all. Am I really going to look back in 60 years time and wish I hadn’t lost £2.12 on that random football game? Of course I’m not. Sometimes to make larger profits in matched betting, you have to take bigger risks. Not that losing £2.12 a time is a ridiculous risk of course but with standard matched betting, you would expect to make a profit on the back of your freebets offered by the bookmakers. When you do these types of bets for the first time, you can start to question everything and I did the same too when I started out in low-risk value betting but you just have to trust the numbers and believe that you are not going to lose over 100 times in a row. If you ever got to the stage of losing 105 bets in a row and you logged it so you know you are totally correct and have actually lost 105 bets in a row, then maybe it’s best to call it a day as you would have to have extremely low luck to be in that position. When I do this offer I always back the underdog, the team that is less likely to win the game. That way I will profit a few hundred quid a time for a couple of quid loss (potentially). By backing the favourites, I will be again risking a couple of quid loss (potentially) for only a £40 profit which is worse value. This means that after 20 bets, I would be at a loss overall which again is terrible value. Value betting in matched betting can seem quite a daunting scary thought at first but once you have got into the habit of it, it can actually be a fun way to make some extra profits from your matched betting activities. From 2 games this season (2017-18) I have made over £400 from this amazing offer; the early payout offer. This requires no freebets or bonuses which again takes less time and also adds to the excitement when the game is live on television (and your other half lets you watch the game of course!). There are no guarantees with these kinds of offers but you have to trust the numbers and know that over the long term you will be in profit without a doubt. The first win may come after 1 bet or 50 bets but when the winner comes in, it will far exceed all your other losses significantly. Imagine getting just one winner a month that would be an extra £223 profit every month. Of course there will be losses before that but you will still be well up in profit over the long term. Using Oddsmonkey will also help with this offer and all other types of value bets in matched betting. They have a calculator specifically designed for the early payout offers so you can even cash out a profit if your team does go two goals up. 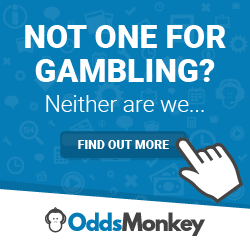 You can join Oddsmonkey by clicking here. Using Smarkets is also a good idea for these kinds of offers because you want to reduce your potential qualifying losses where you can. The 2% commission will save you loads of money in the long term and is generally a better option for matched betting than using Betfair who charge 5%. You can join Smarkets by clicking here. How to take value from odds boosts by matched betting.